Press release from Little Adventurers Nursery. 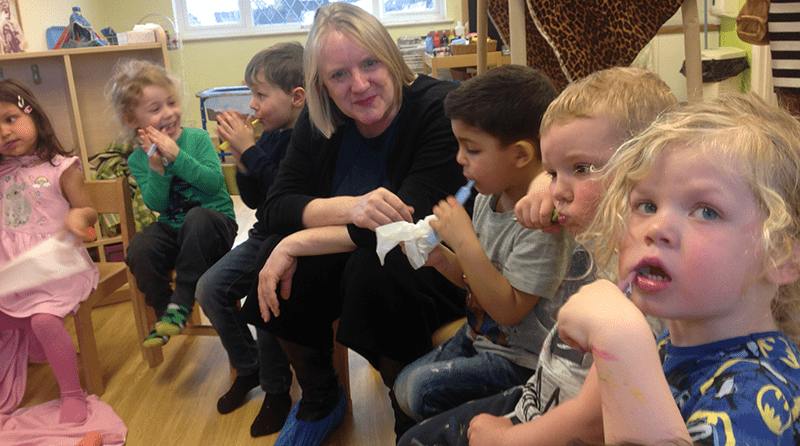 Little Adventurers Nursery in Havering welcomed the Deputy Mayor for Education and Childcare, Joanne McCartney today in recognition of their Silver Healthy Early Years London Award (HEYL). The Deputy Mayor of London together with local officials from London Borough of Havering spent two hours at the setting on 12th March observing the wonderful activities that the staff have put in place to support the children’s understanding of the need for healthy lifestyles. This family run setting which opened just four years ago, is proud to be one of the first nurseries to achieve this award which recognises achievement in promoting and fostering highest levels of health, well-being and school readiness. This new award scheme has been introduced by the Mayor of London to encourage healthy lifestyles for young children and their families. For their Silver Award, Little Adventurers Nursery developed an oral hygiene programme for all children who attend, from the age of 3 months to 5 years. A report issued by Public Health England in 2018 revealed that 12% of all 3 years old’s and almost 25% of all 5-year olds were found to have tooth decay. It was statistics such as the above that led the staff team at Little Adventurers to make oral hygiene a top priority and a focus for their award. A very large sized model of a mouth, named ‘Mr. Teeth’ and a giant toothbrush have proved both a great resource and fascination for the children of the nursery as they learn about the correct techniques involved in tooth brushing. Staff supervise each child with toothbrushing after their main lunchtime meal and advise on other aspects of oral hygiene for example, teaching that it’s better not to rinse fluoride out with water. The nursery appointed their own oral hygiene champion who visits all the nursery rooms giving positive messages about the importance of looking after our teeth and the need to eat calcium-rich foods to help our bodies. The Early Years Team from London Borough of Havering worked in collaboration with the nursery by providing the resources that the manager required for training the staff team for this project which includes offering guidance and support to all families at the nursery in a variety of ways. They share top tips with parents for example, promoting drinking water and milk with their children as part of a healthy diet and to limit sugar intake. Little Adventures considers that optimum nutrition is just as important as physical activity. It is for this reason that they have a partnership with a nutritionist who helps devise all of their nursery menus. The nursery has a Paddington Bear mascot which helps them to promote healthy lifestyles throughout their setting.